The transition from artificial to grass could not have been more evident. The ball swung & seamed & the G&C students' opening bowlers Brandler & Scrace could have blown Pacific away but thankfully they showed mercy and took the foot off the pedal. 5-4 with Holliday, Hollman and more importantly Webley & Tempany all back in the pavilion. The change bowling was not as incisive & Captain Lay dug himself in with a 99-ball 22. Stroke players Faisal & Rademaker played around him but it was the important partnerships of 20 with John Hill & Korgaonkar & Ian Lay's unbroken 9th wicket 30-run partnership that gave the visitors the thinnest glimmer of hope. Key strike bowler Lucius Faisal gave the Islington side immediate hope with 2 wickets in his 1st over however it was more proflogate at the other end as Ian Lay struggled to find the optimum length & opener Vetrivel with Cox scoring at 6 an over to reach 42-2 from just 7 overs when Kurt Rademaker who replaced Lay secured Cox's lbw. K-Rad struck again almost immediatley & at 59-5 the game could go either way. There were no more alarms for Vetrivel until Jon Webley on his bowling comeback from injury removed him with a magnificent caught & bowled to effect the key turning point. Webley & Rademaker continued to press. 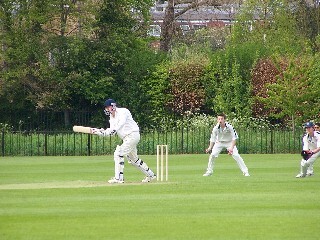 Chowdery was bowled by Faisal in his single over returning at the north end. 109-7. Webley found Northcott's edge pouched by Holliday. 114-8. Rademaker bowled the resistance of Khan. 126-9. By this time only 1 wicket was required for Pacific to win or 8 runs to concede a defeat. Webley, bowling, pushed his field out & from the first ball Sealey took a single to Hollman at 3rd man. With the 2nd ball in his final over, the edge was found & keeper Holliday snaffled it up to win the match. The drama couldn't have been greater & especially as Captain Lay's 3 key bowlers were bowled out with that final over.